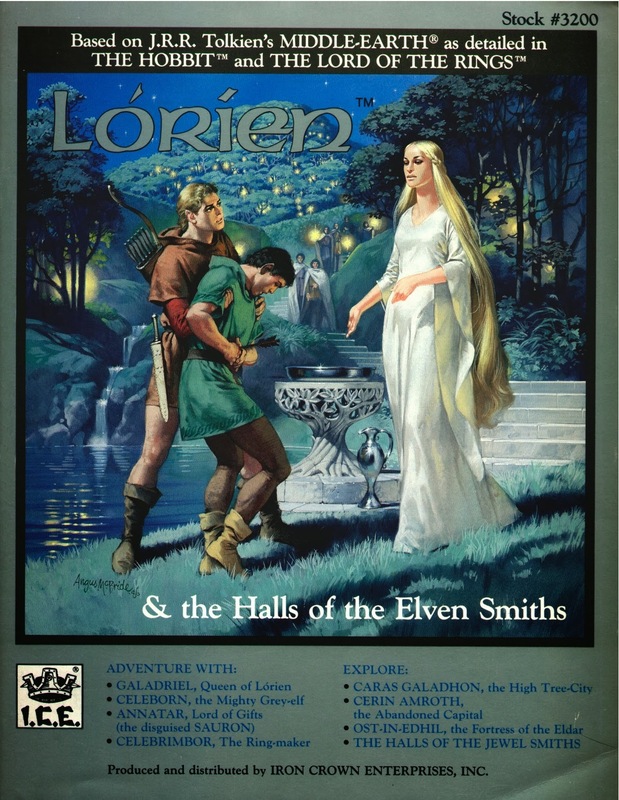 Lorien is a bible for all things elven, and has a joint focus on both sides of Khazad-dum: the Golden Wood and the Jewel Halls. The latter makes this module completely unique in devoting heavy space to a Second Age setting, and I remember breathing the antiquity as a DM; Eregion felt like the equivalent of New Testament times. Honestly, who could pass up the opportunity to visit Ost-in-Edhil during the forging of the Rings of Power? These were the days of the Noldor's last realm, when magic was still unbridled, dwarves were good company, and when Sauron himself, in the benevolent guise of Annatar, "the Lord of Gifts", walked among the firstborn and guided their labors. In these pages, Noldor culture is wonderfully detailed, the personalities of legendary figures like Celebrimbor brought so convincingly to life, and the magic items to be found in the Jewel Halls make TSR artifacts like Daoud's Wondrous Lanthorn look like baby toys. As if these riches weren't embarrassing enough, on the eastern side of the mountains lies the most precious domain out of any fantasy, and where Galadriel wields the power of her elven ring to enshroud it. I gave Nenya's powers a Gygaxian overhaul so its wielder could cause tempus fugit (one week outside = one day inside) or dreamwalk in a 50-mile radius, in line with its protective function; mirror of vision for scrying purposes; and water-breathe & water-walk, create water, wave of water, and part water or cause tsunami once/day, per its relationship to the element of water; plus generic bonuses common to the other elven rings. Nenya is easily my favorite of the three rings; there's something, I don't know, ethereally unnerving about its effects on the Golden Wood (and something Peter Jackson nailed perfectly, despite protests that his cinematic treatment of Lothlorien was too creepy). Vilya heals, and Narya emboldens, but Nenya mystifies with its time distortions and uneasy visions. 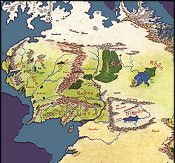 The centerfold color map of Ost-in-Edhil rules the module, and many of its buildings are laid out: Galadriel and Celeborn's house (before Galadriel moved to Lorien, distrusting Annatar), Celebrimbor's island house, Annatar's house (where intruding fools can find themselves teleported to the Barad-dur if they're not careful), other houses and outside estates, the council hall & library, fountain baths, inns, and finally, the prized Mirdaithrond, or Halls of the Jewelsmiths, which is to the Noldor what the lower deeps of Moria are to Durin's folk: "Designed by Celebrimbor, it is a strange marvel of architecture, combining a love for nature with a lust to conquer the mysteries of science as the elves know it." This of course is where the Rings of Power (aside from the One) were forged, and the continual production of mighty artifacts is staggering. There is a table outlining all minerals, elements, metals, alloys, and glasses, their value, and their use in enchanted creations. On Lorien's side of things, Caras Galadhon and Cerin Amroth are displayed, keying the high points of the tree-cities: Galadriel and Celeborn's tree palace, Galadriel's mirror, orchards, and fountains. Worth discussing is the figure of Annatar (Sauron), who in the hands of a good DM can be exploited to maximal effect. In my poor friend's case, the effect was shocking, as he had no idea who "Annatar" was -- any more than I did before buying the module. I kept the secret from him so that he was stunned by the reveal in game play; I think he accused me of inventing a charismatic version of Sauron just to be malicious. It reminds me how much we learned about Tolkien's world through gaming products. (We'd each read The Silmarillion, but the Lord of Gifts evidently didn't make an impression.) Annatar is used so well here, fomenting discord and factionalism among the smiths, like an incarnation of Baal mingling among the twelve apostles. What can I say? Lorien the module is as unassailable as the Golden Wood itself. The one problem I had with the module also related to the cover. The cover and title (Lorien place 1st) leads a buyer (especially a novice buyer to ICE) to believe the module is about 3rd age Lorien. This is far from the truth, with 2nd age taking rouhly 2/3rds or more of the page and word count. I worked in a hobby shop at the time of the modules release, and we had at least 3-4 really disdatisfied regular ICE buyers for this same reason. By this time, the game was firmly set in the 3rd age default time-frame, and a 2nd age suppliment (without clear labeling as such) was disapointing to a magority of our stores ICE buyers. That's interesting, Jay. The cover does make pretty clear that a Second-Age setting is in view (with the mention of Celebrimbor and Eregion), and of course the subtitle is a tip-off too. This is precisely what I loved about the product, and I remember wishing more modules would vary time periods instead of remaining pigeon-holed in 1640. But you evidently saw a lot of different reactions. Thanks for sharing. I do think the sub-title did indicate that the 2nd age would discussed, just not that it would be the majority of the book. 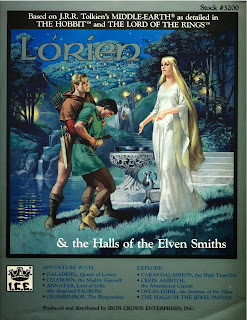 The picture on the cover and Lorien as the first part of the title just make it seem that this area would be the main portion.